The once iconic teen retailer has fallen far out of fashion as fickle tastes have changed over the years. You might not even recognize an Abercrombie & Fitch store these days if you haven't been in one in years. Gone are the bare-chested models, dark corners, shuttered storefronts, and heavily performed aisles. It hasn't helped sales though. Image source: Alan Light via Flickr. 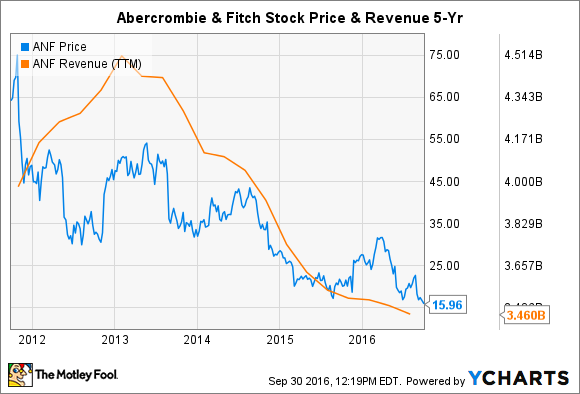 Changing tastes of teen fashion haven't been kind to Abercrombie & Fitch (NYSE:ANF). It's a much different retail world than in 2011 when it said it would willingly pay reality TV personality Mike "The Situation" Sorrentino from MTV's Jersey Shore reality TV show to not wear his clothes. Today, as it struggles to generate sales, it's likely it would pay someone -- anyone -- to wear them. But if you haven't taken a look at Abercrombie in a while, you may be surprised at how much the teen retailer has changed over the years. Abercrombie & Fitch was synonymous with the "preppy look" of polo shirts and popped collars. Its advertising was racy and its storefronts featured shirtless male and bikini-clad female models to greet customers. Then-CEO Michael Jeffries made it known he didn't want ugly people in his stores, once commenting, "That's why we hire good-looking people in our stores. Because good-looking people attract other good-looking people, and we want to market to cool, good-looking people. We don't market to anyone other than that." Five years ago, Abercrombie & Fitch was performing ahead of rivals like Aeropostale, which has since gone bankrupt, and American Eagle Outfitters (NYSE:AEO). Even amid a retail environment worried about persistently high unemployment, rising costs, and the potential for a recessionary double-dip, Abercrombie started 2011 reporting net income of $150 million compared to profits of just $300,000 the year before, with revenues jumping 18% to $3.5 billion. Best exemplified by retailers like H&M, Century 21, and Zara, these weren't classic styles meant to stand the test of time, but rather clothes made to last until the next look came into fashion. Today, the prep style is about as popular as a MySpace profile. When it became clear the only retailers that were posting any sort of growth were those that dominated the fashion forward scene, it was admitted it was a trend that couldn't be ignored. Not only did Abercrombie & Fitch convert its Hollister brand into just such a house, though one that kept its California surf image intact, but Gap (NYSE:GPS) changed its Old Navy store into one as well, and then saw old line department stores like J.C. Penney and Sears Holdings follow suit. Abercrombie transformed its Hollister chain into a fashion forward house, but that hasn't helped sales from sliding, just as they are at its namesake stores. Image source: Mike Mozart via Flickr. At its height, Abercrombie thought it could capture the minds and wallets of shoppers from cradle to grave. It launched its Abercrombie Kids stores to get the toddler age group, and then figuring the kids who wore its clothes in their teen years might also want to do so when they went off to college and got a job, it opened its more mature Ruehl chain. Abercrombie also experimented with lingerie at its Gilly Hicks outlet, which it described as Abercrombie's "cheeky cousin" from Sydney, Australia. While Gilly Hicks lasted longer than Ruehl, the retailer closed both down (though the former survives online) and renewed its attention to its teen customers by selling t-shirts and jeans. It's building on a foundation started by American Eagle, which launched flex jean technology last year. Now Abercrombie is hoping its Epic Flex jeans at Hollister will get a similar reception. But if last quarter's results are any indication, Abercrombie & Fitch may soon find itself out of fashion again. Comparable store sales fell across the board indicating it's not finding the right fit with teens, and it recorded an adjusted net loss of $0.25 per share that missed analyst expectations and sent its stock plunging 20%.